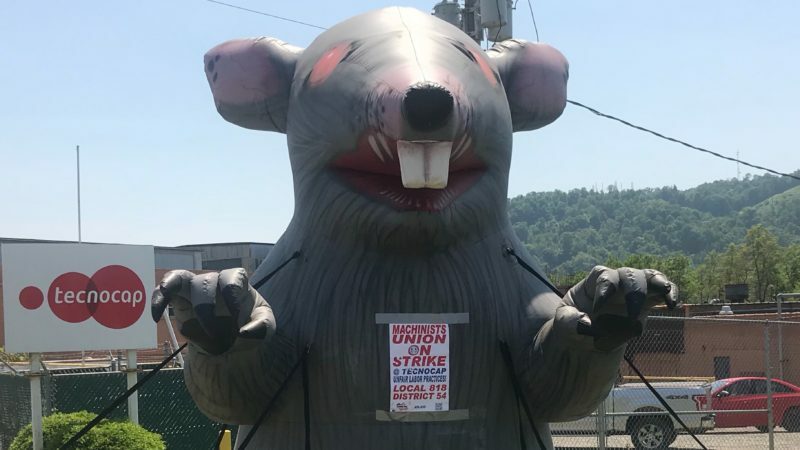 GLEN DALE, WEST VIRGINIA – Ten miles south of Wheeling West Virginia on Route 250, sits a giant inflatable rat “Scabby” hovering over a porta potty on the picket line outside of Technocap. It’s a site that’s tough to miss as you drag along the main thoroughfare, but for over a month, the local papers, The Intelligencer and Wheeling News-Register, both owned by billionaire Pittsburgh Pirates owner Bob Nutting, have refused to cover the strike. “The only things we see in the paper is ads for Technocap wanting to hire other people to come in and take our jobs,” says Harlen Smith, a 22-year veteran of the Technocap specialized lid manufacturer. The strike at Technocap began in April shortly after the specialized consumer goods’ lid manufacturer demanded to do away with union job classifications at the plant. The company also demanded that workers pay 50 percent of their premiums for health insurance. The company also demanded to kick a third of the bargaining unit off the union contract. Facing the potential elimination of key union security language and a third of the bargaining units, all 30 of the skilled machinists represented by Machinist Local 818 chose to go on strike. “There doesn’t seem to be a lot of respect anymore like there used to be back in the day,” says 41-year-old die setter Harlen Smith, who started working at Technocap when he was 19. The strike is the first at the plant in over four decades and follows a lockout of another group of union workers at the plant earlier this year. The Machinists have filed unfair labor practice charges with the National Labor Relations Board against Technocap, alleging the company has refused to engage in fair bargaining with the union. During the five weeks that workers have been on strike, the company has refused to sit down at the bargaining table and see if they can work out an agreement. It’s been a difficult grueling fight for the workers with many falling behind on their mortgages, as workers are forced to subsist on a mere $150 a week in strike benefits from the Machinists and food donations from local unions. “It’s frustrating, it’s been hard on everyone,” says Smith. With Memorial Day coming up, many of the workers have had to cancel family vacations. “That [vacation] money is now used for bills. You go two months without pay and it’s tough for people” says Smith, who had to cancel a trip with his family to the graduation party of a close friend’s child in Illinois. “It puts a lot of strain on a lot of people’s families,” says Smith. However, despite the sacrifices, workers have remained tough. Last week, they got a jolt of energy when one worker, 58-year-old Ron Stipetich, finished his probationary period as a new employee and immediately decided to join the union and go out on strike. While the 30 workers of Machinist Local 818 are putting up a tough fight, the lack of media support has hurt their ability to amplify their story in an attempt to gain community support. Support, which is all often crucial to putting pressure on elected officials to get Technocap to maintain the union quality of life at the storied lid manufacturers. However, the two local newspapers in Wheeling both owned by Pittsburgh Pirates owner Bob Nutting, have so refused to cover the machinists’ strike. The Intelligencer and the Wheeling News-Register are two of nearly 40 papers owned by Nutting’s Ogden Newspapers Inc. The media group is based primarily in Northern Appalachia and owns over two dozen newspapers scattered among Southern Ohio, Northern West Virginia, Western Pennsylvania, Western Maryland and the Shenandoah Valley of Virginia. In the heart of Rust Belt, the Nuttings own marquee papers in mid-size cities such as the Altoona Mirror, the Parkersburg News and Sentinel, the Winchester Star, the Frederick News-Post, and the Fort Wayne News-Sentinel. With Nutting owning so many newspapers in such a critical region of the country, many wonder if the owner’s editorial biases are behind the lack of labor coverage in those publications. “To me, the way I have always seen it done in local newspapers it at least makes mention of it, whether they are gonna report on it from our side or just get their word straight from the company, at least they report on us,” says Machinist Union spokesperson John Carr, a three-decade veteran in the labor movement both on the shop floor and on union staff. However, Carr says both of the newspaper in Wheeling have refused to return phone calls or emails about covering the strikes. This, despite the fact that two local TV stations decided to cover the lockout after being attracted to the site after spotting the Scabby the Rat. The failure to cover the strike raises questions in Carr’s mind about the editorial state of the two Wheeling newspapers both owned by Nutting. “For this to come right on the heels of the teacher’s strikes and not even get a mention [in the newspaper], I am just flabbergasted,” says Carr. At the time of publication, the combined editorial leadership of the two Nutting-owned Wheeling papers did not respond to request for comment as to why his two papers in Wheeling have not covered the Technocap strike. No fan of unions, Nutting is currently facing a grievance by Major League Baseball players’ union for violating the collective bargaining agreement. The players’ union alleges that Nutting, despite being a billionaire, refuses to spend revenue sharing money on players’ salaries as stipulated in the collective bargaining agreement. Nutting has taken a similar low-road approach, underfunding the newspaper he owns. He has developed a reputation for buying newspapers, slashing budgets, and reducing them to community bulletins with sports scores, crime reporters, community bulletins, and little hard investigative reporting. In the summer of 2017, Nutting took over the Uniontown Herald-Standard right across the Pennsylvania-West Virginia border. Immediately, Nutting cut the staff of the landmark Southwestern Pennsylvania paper in half from 70 down to 35, leaving working folks in the region that prides itself on its union legacy essentially stuck in “news deserts” with no hard reporting on the issues most important to their livelihoods. However, labor leader say it’s just not just the Nuttings that are depriving the region. The right-wing Scaife Mellon owned Tribune-Review newspapers rarely cover labor in a positive light and the most prestigious newspaper in Northern Appalachia, the Pittsburgh Post-Gazette, which is facing NLRB charges of its own from its union, does not even have a full-time labor reporter. The result, labor leaders say, is that the region is deprived of valuable labor reporting that could help workers build support at a time when the region is under attack from anti-union forces, who recently spearheaded an effort to pass “right-to-work” legislation in West Virginia. Labor leaders across America have cited the sympathetic wall-to-wall media coverage of the teachers’ strike as helping to propel their success. However, in workplace struggles like the strike at Technocap, workers still find themselves ignored by local newspapers that are far too often owned by billionaire anti-union activists like Pittsburgh Pirates owner Nutting. Still, despite the lack of media coverage, the workers at Technocap say they intend to soldier on. “We just want respect,” says the short, but stocky 22-year crew employee of Technocap. Be the first to comment on "Pittsburgh Pirates Owner’s Newspapers Refuse to Cover Machinist Strike in West Virginia"